To whom it may concern, My name is Mihaela SAVA, I am a 24-years recently draguate medical doctor from Cluj-Napoca, Romania. Between the 15th of January and the 15th of March 2013 I participated in a EVS (European Voluntary Service) Project in Lomé, Togo. The project was finaced by European Union and implemented in partnership by Millennium Center Association (Sending Organization) and ACET Association pour la Culture, l`Education et le Tourism au Togo (Host Organization). The 18 romania volunteers devided in three groups developed the following activities : Awareness raising campaign on health issues, Non-formal education and Training courses. I was involved in awareness raising campaign on health issues in Lomé and different communities from Togo. The main topics of our campaign were hygiene and diseases that can be transmitted in its absence, first aids, HIV infection, food and dietary diversification and the importance of addressing to the medical staff for a qualified treatment. The project started with thr On Arrival Training when the host volunteers provided us useful information for our two-months staying in Togo. Starting from the 21st of January the location of the activities has changed weekly, so by the end of nine-week project we managed to sensibilize the population from Lomé, Atti-Apodokoe, Ando Center, Assahoun, Ekpui and Koumea. With the agreement of the two organizations I participated in a one-week clerkship at CHU Sylvanus Olympio Universitary Hospital Lomé in the infectious diseases department. The colleagues were friendly and opened to exchange idea and good practices. Although the level of my french knowledge was basic, I felt useful and gained new skills thanks to the team I worked with who was willing to translate and clarify to me. The collaboration with ACET volunteers went well, they were opened to our requests, ideas and suggestions on proffesional or personal level. Each of the three groups benefited of one local facilitator and one mentor, I had the pleasure to work with Bené and Bernard. In my opinion the group I was part of was priviledged by spending five days/week in the communities. In this way we had the chance to experience the real african life style, with its needs (no electricity, boiling the driniking water, toilets far from the house, etc.) and with its beautiful culture and joyful people. Also offerd us the opportunity to spend time with the locals, cook and eat the traditional food, experience the traditional habits and rituals and build strong friendships within the group. The facilitaror, Bené handled difficult situations with proffesionalism and calm, was attentive to the needs of the group, was opened to suggestions and solutions given by the volunteers. As weel the mentor, Bernard was full time at out disposal and helped the group with the administrative work, in the villages: cooking, finding water, providing food, etc. Given the fact that there was a language barrier, either because the most of the volunteers preferred using english to communicate or because the majority of the population in the villages spoke in dialect (ewe or kabye) the presence of the facilitator and mentor was necessary full time. I can recommend to any person interested in volunteering in Togo to collaborate with ACET, to be opened to experience new things and to keep the positive attitude. "Courez vite à l’ambassade prendre un visa et décoller pour le Togo avec ACET !! C’est une fabuleuse expérience, riche en émotions, en rires, en larmes (oui parce qu’arrive un moment où il faut partir !). L’équipe est géniale, elle vous accueille comme des princesses, on est chouchoutées ! Le projet de soutien scolaire s’est déroulé dans les meilleures conditions, les enfants sont tout simplement formidables, ils savent humainement tout nous donner, d’une générosité sans nom! On a passé un mois de grand bonheur, on a ramené pleins de trucs et laisser beaucoup d'habits! On été à 8 sur le chantier dont 4 filles et 4 garçons, donc c'était parfait! On s’est très vite adapté au mode africain, des conditions différentes mais pas gênantes (nous sommes de française pourtant habituées à notre petit confort^^). Heureusement que les filles togolaises étaient là parce-ce qu'on a très bien mangé durant tout le séjour ! Une soirée africaine traditionnelle est au programme et elle fut réussie puisque 300 photos au compteur rien qu’à elle ! Venez comme vous êtes, avec votre motivation, votre passion, et le reste se fera tout seul ! Petits conseils pratiques à ne pas oublier avant de partir : une paire de tongues !! un maillot de bain, et pleins de mouchoirs (pck on en a toujours besoin !!) et pleins de matériel de récup que vous trouverez!!! 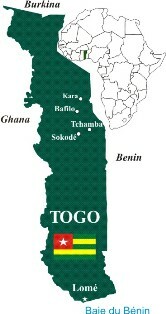 Akpé kaka Acet-Togo !! "